The patient is a 72 year old white male with ischemic cardiomyopathy, prior infero-posterior wall myocardial infarction, status-post three-vessel coronary artery bypass graft surgery, chronic renal failure and a dual chamber permanent cardiac pacemaker that was implanted 3 years ago. The patient was admitted because of generalized weakness. Physical examination revealed a BP of 120/70 mm Hg and a regular pulse of 60/min. Respiration was unlabored at 18/Min and he was afebrile. JVD was engorged to angle of jaw at 30 degrees with prominent V waves. The abdominal-jugular reflux was negative. A grade 3/6 holosystolic murmur was heard at the left sternal border with augmentation during inspiration. A soft and intermittent S3 gallop was also heard in this area. The lungs were clear. Except for a healed midsternal surgical scar and a permanent pacemaker generator in the left subclavian fossa, the remainder of the physical examination was within normal limits. Laboratory data revealed a BUN of 36 mg%, serum creatinine of 2.8 mg%, Hb of 10 G and Hct of 30 % WBC of 34,000 with 70% segs and 10% bands. Initial blood cultures revealed gram positive cocci in clusters. The 2-D echocardiogram in the top row (below, right) shows the right ventricle and right atrium, as selected from the 4-chamber view (below, left). 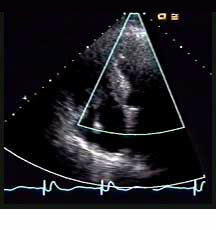 The echocardiogram in the bottom row shows another view of the right ventricle and right atrium, clearly demonstrating the highly mobile mass that prolapses through the tricuspid valve.